We have one of the largest concentrations of nuclear physicists in academe, working under the aegis of the Center for Nuclear Studies, closely allied with the Thomas Jefferson National Accelerator Facility in Newport News, Va., and supported by the Department of Energy, the National Science Foundation, and the University. Fifty years ago, it was Gamow's insight that the basic interactions between particles shape the structure and evolution of the universe. As he recognized, to investigate behavior at smaller and smaller distances, we must use more and more energy to slam particles against each other. That process gives us a view of what the universe was like when it was small, hot, and only minutes old. Today, our nuclear physics experimentalists and theorists are refining knowledge of both light nuclei, such as those in helium and lithium, and heavy nuclei, such as the core of uranium atoms. A major part of this research is the quest to see the effects of quarks, the small elusive particles inside the protons and neutrons inside the nuclei of atoms. Collateral to these investigations are new ways to answer major questions about our universe, such as its age and composition. Some years ago, Professor Barry Berman and his colleague J. C. Browne (now director of Los Alamos National Laboratory) used the rate of decay of various heavy nuclei to estimate the age of the universe-17 billion years (give or take 3 billion). The latest astronomical data give a number close to that estimate. Programs in this area have been active at GW for more than 40 years. There is new excitement in the investigation of unusual materials under extreme conditions, such as high-temperature superconductors, which let electric current flow without any resistance. Professor Mark Reeves and his collaborators spearhead our experimental efforts toward understanding how a mysterious new class of such materials shows superconductivity, and how they are affected by the strong fields necessary for magnetic applications-including new highly efficient electric power generation and distribution. Following Gamow, our faculty has had a continuing interest in the application of physics to biology. 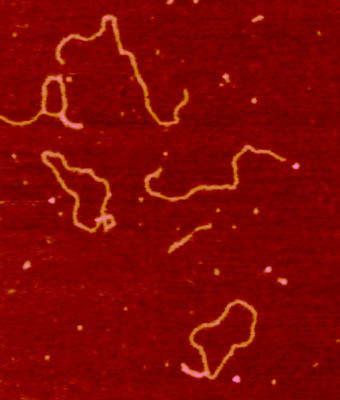 Recently, Dalong Pang, a PhD student under Berman's direction, investigated the damage produced by radiation on DNA by using, for the first time, instruments to directly observe the effects. As an example of the symbiotic relationship our theoreticians have with the experimentalists, I was able to contribute a theoretical model to help describe Pang's results. Knowing how and where our DNA is vulnerable will help us formulate strategies for protecting ordinary cells, and for knocking off cancer cells. Our department anticipates new cross-fertilization between biology and condensed-matter physics toward understanding the mechanisms of molecular biology and devising new principles governing systems of a large number of interacting entities. 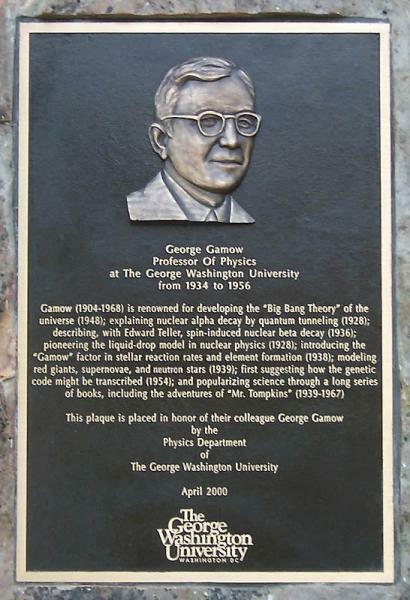 This site also contains a brief biography of George Gamow by Prof. Eamon P. Harper.